Oktay, from Backupsy, is back with three different offers. Two of the plans below were featured on their last post, but only in Chicago. Now they are also available in Buffalo and Dallas. A NL based plan is also available. 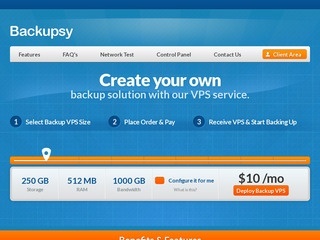 Backupsy were first featured a little over a month ago. With the recent SolusVM shenanigans, it’s worth noting Backupsy have their own custom-coded control panel. Us nodes are running Dual X5570/L5630/L5520 CPUs, 64GB RAM and multiple Seagate Constellation ES or Hitachi Enterprise Drives in RAID 50. Dutch nodes are running a Dual X5650 CPU, 64GB RAM and multiple Hitachi Enterprise Drives in RAID 50. The few reviews that were left on their previous offer were all good. If you signup, keep us up to date with what’s happening. Backupsy accept payment via PayPal and credits/debit cards via 2Checkout. We are told that the Uptime for last 30 days is at 99.968%. They provide a 7 day money back guarantee and a 99.9% uptime guarantee. Servers will be provisioned instantly and are connected to a 1Gbps port. They have all the major Linux distributions like Ubuntu, Debian, CentOS while having external storage oriented operating systems like FreeNAS, OpenFiler, OpenMediaVault, TurnKeyLinux Fileserver and Nas4Free. US Locations are allowed to run software/OS that assists backing up, owncloud, private VPN/Proxy, development, monitoring and other light CPU and IO intensive applications except Torrents, TOR and Game Servers. NL Location is allowed to run anything except Torrents, TOR, Game Servers. For more information, have a read of their Terms of Service. I’ve heard a fifth location is in the works. Not bad for a two month old company! A two month old company? Hmm..that means I’ve signed up for a plan since inception. I have nothing but praise for Backupsy. @serverian is obviously good at his work, and resolves support tickets very quickly. Most responses have been attended to within half an hour. Last but not least, it has to be noted that when all hosts on SolusVM have disabled their SolusVM panels in light of the recent hacking/vulnerability disclosure menace, my Backupsy panel has been on 24×7. No issues worth mentioning. I recently switched nodes, and also ordered the $2 extra for full VPS usage. @Joel perhaps I miss-read during order as this was a complete impulse buy, what is the $2 extra for exactly? Thank you Joel, Anthony! That $2 option upgrade for the USA located plans. With that, you can use your backupsy for anything except Torrents, TOR and Game servers in the USA. I cannot seem to find freenas in the list when ordering? Just order it with OpenFiler and we’ll mount the FreeNAS ISO for you Anthony. I like openmediavault that is what I setup on my backupsy server. What OS or script is recommended for easy file sync between my Windows and Android machines? How much for more GB on a 500GB US plan? who programmed your KVM panel? it looks nice. Got nothing to say praise for these guys. Just ordered one and getting great performance and network speed using rsync. Raised a ticket because I had a problem, and got a response/resolution within 1 min. Just got 500GB US deal for backup purpose. Purchased the NL plan. Over 2 hours and the VPS is still pending. Creditcard is billed and they have my money, but I do not have a VPS. Submitted a ticket, no response. Rather disappointing. Sometimes some orders are marked as manual check, that’s why you didn’t receive your VPS instantly. i’m interesting in the Netherland plan. what is the port speed of the Netherland VPS ? NVM. i saw the port speed in the description. BTW does Netherland VPS plans allow game servers ? Unfortunately, we don’t support game servers at all. The prices are amazingly cheap, I may even have to get one and see how it goes! How much for a 500GB NL plan? Please open a ticket at sales@backupsy.com to get a quote. I am definitely interested in buying a 500GB storage VPS for backing up some data along with my MP3 music library. Would it be allowed under the TOS if I were to set up subsonic on the VPS and use it to stream music to my phone, tablets and roku player? Nice panel, nice deal, I just got one in order to backup my VPS. I was scared by that SolusVM exploit because all my provider using that software. I’m very lucky not affected by that but I start to think the backup things. I think that most low-end vps providers not providing backup. We are responsible for our own data. By the way, I want to ensure that whether Gitlab was allowed? I want to backup my code also. Backupsy is great! I went with the 500GB plan and then doubled it. Running own cloud on it. Very fast. Looks like a great deal, my only concern is I/O being blown up by this kind of deal. Anyone have any issues so far? We have not faced any IO issues. Our dd is doing over 500MB/sec all the time. We have many people running ownCloud with default 512MB RAM without any problem. It runs fine on 512 even when configured with mysql. Last time I looked my box was pulling 177MB ram. Send an email to sales@backupsy.com with your reason to use windows and we’ll look into it. I think the test file for Buffalo & Lombard indicated wrongly in post above. I’ve asked @Liam about it. Thanks for pointing it out! Just purchased the NL plan; great performance and speed. How much for 500gb in NL? Please send an email to sales@backupsy.com and we’ll give you a great offer! I have ordered the US 250GB plan + Regular Usage addon in order to host my website. I keep you aware how it is going on with the support and set up. Can I run a website with lots of video tutorial in US location? Sorry, that’s not permitted at the moment. servian, if you still on this thread, do you allow private Tahoe-LAFS and the running of Ubuntu CD mirrors? Tahoe-LAFS, yes. Running of Ubuntu CD mirrors, no. Hi serverian, when I use the order link for the 512mb US package, the price shows as $10 (Buffalo). Is the deal offer still available? Thanks. The deal is still available. Please click the Checkout button to see the discounted price. Our new Los Angeles location is UP! Not possible to upgrade the RAM if needed ? Our new Denver location is UP! Sent a support ticket and got a reply within 1min! Fastest support I’ve ever seen. Nice. I order and paid (Already receive detail) But refunded. Should I know the reason of refund? Great Offer .Can i use my own OS ISO? Do you offer addon IP’s? Awesome price, good server performance, huuuuuge space for a web server (add $2/month fee). Above all, great support (answers within 5mn in average). Recommended. I only hope they will last for years. Hai, can i use private torrent in vps? Can i do all this on your plan..
1. Can I install a repository git? 2. Can I pay yearly with the promo code monthly? 2. Can we re-install OS ? Like I order VPS with FreeNAS but if I want to reload with any other linux template later then can I do it myself from control panel? 3. Can we run private vpn (again private! for personal use) is allowed ? Do you still happy with backupsy? I need to host sound files of my user and backupsy looks like a great option. I’ve used backupsy nearly since the beginning, and their support has been top notch — not that I’ve needed it much! The VPS works and works — its been down a few times in the last couple of years, but they are proactive in notifying of issues and resolutions. No complaints for uptime or server responsiveness.